Levaquin is a synthetic antibiotic of the fluoroquinolones group, which has a wide spectrum of antimicrobial activity. The advantages of Levaquin include high efficiency in the treatment of lower respiratory tract infections and a good safety profile. 500mg/20ml, 750mg/30ml solution for intravenous use. The active substance of Levaquin is the antimicrobial agent Levofloxacin, which was synthesized and developed at the end of the last century in Japan. Respiratory tract infections (community-acquired pneumonia, acute sinusitis, nosocomial / legionella pneumonia, exacerbation of chronic bronchitis). Levaquin has the optimal pharmacokinetics, which allows to take it once a day. The food consumption does not affect the absorption of the antibiotic, yet Levaquin oral solution is recommended to be taken one hour before or 2 hours after a meal. In acute respiratory infections, the dose of Levaquin ranges from 500 mg to 750 mg per day. The duration of antibiotic therapy for pneumonia is usually one to two weeks. 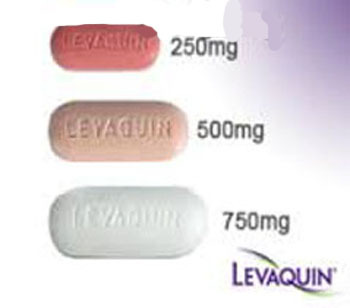 In complicated infections of the skin and soft tissues, the daily dose of Levaquin is 750 mg for 7-14 days. The dose of the antibiotic for the treatment of uncomplicated infections is 500 mg of Levaquin once a day for 7-10 days. In the treatment of complicated infections of the urinary tract, including acute pyelonephritis, the therapeutic dose of Levaquin varies in the range of 250-750 mg per day. In the treatment of uncomplicated urinary tract infection, the recommended daily dose is 250 mg of Levaquin for 3 days. Levaquin is not prescribed in pediatric patients, except in cases of severe infection, when other drugs are ineffective. In the USA, Levaquin (Levofloxacin) is approved for use in pediatric patients only for the treatment of plague and anthrax. Levaquin is not metabolized by the enzymes of the cytochrome P450 system, so no clinically significant drug interactions are noted. Trials have shown that the simultaneous use of Levaquin with medications that containzinc and iron, with antacids and sucralfate slows the absorption of the antibiotic. Therefore, it is recommended to observe a two-hour intervalbetween the intake of these drugs and Levaquin. The consumption of dairy products with Levaquin also interferes with the absorption of the antibiotic. No clinically significant interaction between the drugs has been identified, in simultaneous use of Levaquin with Warfarin, Theophylline, and Digoxin. Concomitant use of Levaquin with a non-steroidal anti-inflammatory drug may increase the risk of CNS stimulation and cause convulsive seizures. Levaquin is well tolerated and is one of the safest antibiotics. In most cases, the adverse effects of Levaquin are dose-dependent, transient, and do not require discontinuation of the antibiotic. The most frequent undesirable effects are reactions from the digestive tract, like nausea, diarrhea, abdominal pain, and dyspepsia. From the side of the central nervous system, patients may note dizziness and headaches. In very rare cases, tendinitis and tendon rupturemay be marked in Levaquin use. During the treatment period, patients, especially the elderly,are recommended to drink more fluids. Levaquin should be prescribed with cautionto patients with a predisposition to convulsive reactions, including cerebral circulatory disorders, organic CNS diseases and cerebral arteriosclerosis.